MamaEatsClean: Sunday Reflections - How Adrenal Fatigue settled in my Shoulder and Neck - And How I Recovered! Sunday Reflections - How Adrenal Fatigue settled in my Shoulder and Neck - And How I Recovered! This is the story of how my spirit was almost broken. How I lost faith in Western medicine. How I found natural medicine. And how I recovered. It all started with my shoulder. My shoulder that was just fine............and then suddenly was not fine. When baby #2 was about 1 year old (that's about 3 1/2 years ago now) my shoulder mysteriously started to get really achy. Like major tension. Tension to the point of pain. At first I thought it was from carrying baby around, nursing, barely sleeping for 3 years. And I thought it would pass. So I didn't do anything about it right away. I was waiting for it to go away. At about the same time I started feeling anxious, dizzy, tired, spaced out and/or moody. But I was in pain, so any "other" symptom I was feeling other than shoulder pain I chalked up to being a side-effect of my shoulder pain. If only I knew then what I know now. The tension was pretty excruciating, and it didn't take long for my sore shoulder to move around to the back of my neck, up the side to my temple and around to the front of my neck. The front of my neck was probably the worst as I often felt that I couldn't swallow or get a complete breath. It was scary. And so began the visits to a long list of different medical professionals. Just to give you an idea of how desperate (and determined) I was to get some relief here are some of the things I tried: four different chiropractors, numerous massage therapists, one physiotherapist, and acupuncturist, a pain specialist, my family doctor, two emergency room doctors and a sports medicine doctor. During all those visits I had massage, acupuncture, acupressure, laser, ultrasound, myofacial massage, active release therapy, stretching, adjustments, a thyroid ultrasound, x-rays, trigger point injections, Graston and an MRI. All of this happened over an 18 month time period. Eighteen months where pain consumed my thoughts and my days. That's how a spirit can almost get broken. And somewhere in the middle of all this my dad got sick. Terminal cancer. And oh boy did my neck really go crazy then. I remember making the emergency three and a half hour drive to my home town when he got admitted the first time. My neck "fired" off the whole time. Spasms after spasm after spasm. It was the one time I actually decided I needed medication. I went to the emergency room (I was at the hospital anyway and everyone could see my muscles jumping uncontrollably) and they gave me some muscle relaxers. I normally stay away from medications but it did give me some relief. I am a very determined person so I refused to give in. My doctor said "well it sounds like you've tried everything, you might just need to go on pain killers". That was his answer. Seriously. My shoulder was fine one day and not fine the next. I didn't do a thing to injure it. And somehow I passed between the phase of "you haven't had this long enough to consider it serious" to "this is a chronic condition that probably can't be reversed". WTF. I was NOT IMPRESSED. And I didn't want anti-depressants or toxic pain killers. And I was not giving up. Some of the professionals that "tried" to help me just saw dollars signs when I walked through the door. Sad but true. I could quickly tell the difference between "desperate to help you", "desperate to get some money out of you before I pass you off to the next guy" and "desperate to get rid of you". But some of the professionals that did help me, mentally if not physically, showed an amazing amount of kindness and caring. Certain ones actually looked into my eyes, really looked and saw hopelessness and wanted so badly to help me. I thank every single one of them. And each one of them played their own role in getting me to the finish line. Like the chiropractor who specializes in Chinese medicine that looked into my eyes and said "you are tired aren't you? Something else is going on here, its not just your shoulder". He called me FASCINATING several times after I stuck out my tongue and it was shaking like a leaf. I hadn't been called fascinating my a man for quite some time - it was quite a boost to my ego. LOL. He also told me about "plum pit". A term in Chinese medicine used to describe the sensation of having something stuck in your throat. You don't know the relief I felt when I looked this up and realized I wasn't imagining this discomfort - people have experienced the sensation for 1000's of years. And no. It doesn't show up on a thyroid ultrasound. I was finally starting to question whether there was something else going on here. A shaky tongue can't all be due to a "shoulder injury". Like the pain specialist who ordered an MRI. I think he knew that nothing would come of it. But I think he also knew that I needed peace of mind more than anything at that point. My dad just died of a brain tumor and no-one could explain why my neck and shoulder were going bezerk. If that isn't enough to feed anxiety I don't know what is. Like my friend Jaime, who gave up many hours of her free time tying desperately to treat my shoulder with physiotherapy. And who eventually referred me to a Naturopath. Thank-you. Thank-you. Thank-you. Like my chiropractor Dr. Luke. Kind and caring Dr. Luke. Yes, I named my son Luke. No, I didn't name him after my chiropractor. But he probably deserved it. He gave me my life back. Maybe I did name him that on purpose. Like the naturopath that recognized right away that my body was completely out of balance. Not just my neck/shoulder/back. So what finally fixed my shoulder? 3) Not sleeping with my arm over my head or laying on that side of my body during the night. 4) Building strength by working out and doing resistance training. 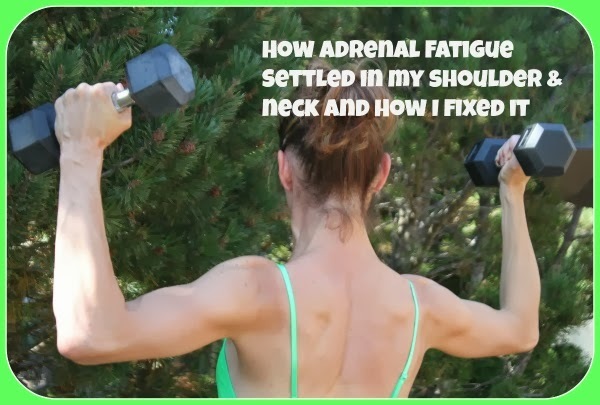 I now believe that my adrenal fatigue, brought on my a combination of stressful events and breastfeeding depleting my body of much needed nutrients, is what triggered my shoulder tension. And I just happened to have one of the most stressful years of my life right after it was triggered. Which just exasperated the problem. And so what is the status of my shoulder now? Well, it is 95% about 95% of the time. I still need to take care of it. It can get fired up after a work out. Or a bad night of sleep where I toss and turn. But generally it is pretty good. I haven't seen my chiropractor in about 5 months. I have some residual scar tissue and tendinitis left in that shoulder from the months of muscles fighting against each-other so it will never likely be 100%. But I'm happy with how it is now. And I didn't take any drugs (save the muscle relaxers) to fix it. Yay! I can do handstand push ups now. And full cross fit burpee's. And throw my baby in the air. If you are experiencing shoulder/neck/throat tension really think about why? Is it normal? Is your body trying to tell you something? Something that has absolutely nothing to do with your shoulder and everything to do with your body being out of balance. Your digestive system. Your adrenals. Your mind. Just don't give up. Don't give in. Someone will help you. Someone will figure out what is wrong. Look outside the box. Look for non-traditional treatments. Keep trying. You can be fixed. HAVE HOPE! I feel so so desperate to get better. My story is similar to yours. I have tried almost everything. There HAS to be that 'something' that I haven't tried yet!